Reports indicate that HIV (human immunodeficiency virus) infections in the Philippines have reached epidemic proportions. Source: Department of Health (2018). HIV/AIDS and ART Registry of the Philippines: January 2018. Department of Health, Epidemiology Bureau, Manila, Philippines. Available at: http://www.aidsdatahub.org/sites/default/files/publication/Philippines_HIV_January_AIDSreg2018.pdf [Accessed April 6, 2018]. The HIV/AIDS & ART Registry of the Philippines (HARP) revealed that 1,021 new HIV-infected individuals were reported in January 2018, of which 17% of the newly diagnosed already showed signs of advanced HIV infection. With patients’ ages ranging from 3 to 61 years old, more than half of the newly tested were 25 to 34 years old, and 29 percent were 15 to 24 years old. Dr. Edsel Maurice T. Salvaña, director of the Institute of Molecular Biology and Biotechnology of the National Institutes of Health (NIH), University of the Philippines Manila, said that although the prevalence of HIV infections has gone down by 25 percent in most parts of the world, HIV in the Philippines has gone up by more than 25 percent in the last ten years. TED Fellow Dr. Edsel Salvaña describes the aggressive HIV subtype AE that’s currently plaguing his home of the Philippines—and warns us about what might become a global epidemic. “It is now the fastest-growing HIV epidemic in the world,” Salvaña said during the scientific conference hosted by the NIH at the Bayanihan Center, Pasig City on March 14. He explained that the majority of infections from 2006 to present was locally transmitted, and that the epidemic is attributed to a shift in HIV genotype, “from subtype B to what looks like a more aggressive subtype CRFo1_AE (AE, for short), which is not a new subtype, but is more common in Thailand and other parts of Southeast Asia.” This genotype shift was discovered through research at the NIH. “It’s now a local epidemic, and the trajectory is quite alarming. In 2000, we only had one new case every three days. In 2007, only one case a day. In 2009, we had two new cases a day. Now, we have 31 cases a day,” Salvaña said. 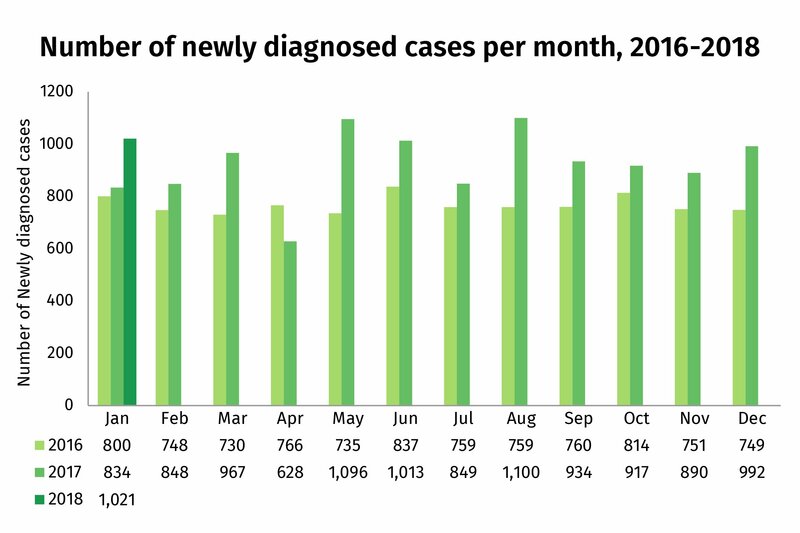 There have been 10,111 reported cases from January to November 2017, or more than 50,000 since 1984 when the first case of HIV in the Philippines was reported. The subtype AE is more aggressive and more transmissible, as illustrated by Salvaña. “This is partially responsible for the explosion of cases in the Philippines. Before the year 2000, about 71 percent were subtype B (the subtype that is more common in the US and Europe), and now it’s 75 percent subtype AE and about 22 percent subtype B. The most common subtype in the world is C, which represents about 50 percent of cases in the world, and most of that is in Africa. Whereas subtype B, the most studied subtype, only represents about 12 percent of the world’s HIV population,” he said. Salvaña further said that an explosive epidemic in the Philippines because of a genotype shift could have global implications. He added that subtype AE infections were also emerging in other countries, including the US, Canada, and Australia, and that the problem might become more complicated due to drug resistance. “Research geared towards supporting policy has always been the guiding principle for our HIV work in NIH. We looked at prevalence of HIV in special populations and described the changing molecular epidemiology of HIV in the Philippines, leading us to discover that the shift in HIV genotype is a major factor in the current epidemic. In addition, we were the first to do a systematic study on the emergence of drug resistance on treatment, and we are currently doing work on transmission of HIV drug resistance which is essential to long-term planning for HIV control and elimination efforts,” Salvaña reiterated. The research efforts of the Institute of Molecular Biology and Biotechnology focus on the prevention, early diagnosis, and treatment of the top causes of sickness and death in the country. The NIH offers a variety of cutting-edge services, among them HIV drug resistance testing, genotyping, and research on other disease-causing bacteria and viruses. “This is no longer something to be scared of,” Salvaña said, as he encouraged people to get tested for HIV. He said earlier diagnosis means better response to medication, and longer life. Antiretroviral Therapy increases the survival rate in HIV patients. “With treatment, you can live a long and full life. After an unprecedented global effort in research and aid, effective medication was discovered. Turning point came with the discovery of protease inhibitors, and the use of HAART, or High Active Antiretroviral Therapy). Our HAART is a combination of three drugs. The people who use it don’t die of HIV. Most of the data generated on the effect of Antiretroviral Therapy is abroad, but we do have local data here at the NIH. If you are diagnosed with full-blown AIDS, you are six times more likely to die. So you really want to get diagnosed early,” Salvaña said. “Being on treatment reduces risk of transmission by 96 %. New data suggests that if your viral load is suppressed, which we expect after six months of taking your treatment, your risk of transmitting HIV is zero. Undetectable equals untransmissible. Treatment restores your health for you to be able to do the things you used to do. You do not put your loved ones at further risk,” concluded Dr. Salvaña. TED Fellow Edsel Salvana describes the aggressive HIV subtype AE that’s currently plaguing his home country, the Philippines — and warns us about what might become a global epidemic.